FRANKLIN, Mass. 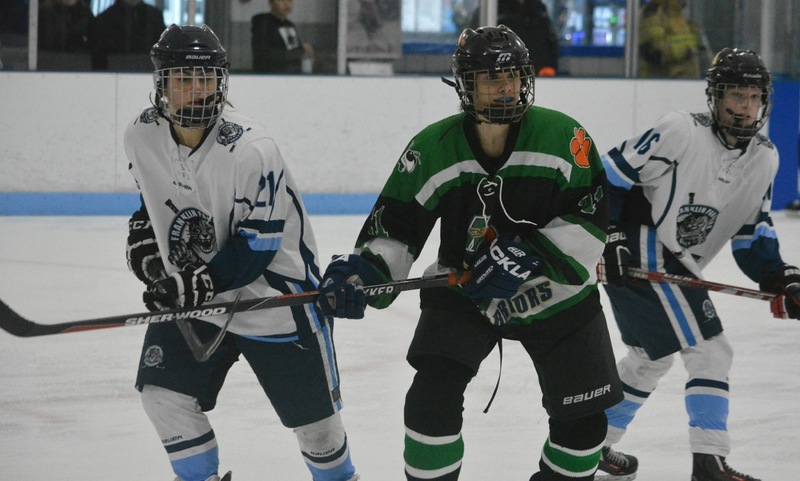 – Hockomock League history was made on Saturday afternoon at Pirelli Veterans Arena, when Franklin hosted Mansfield/Oliver Ames (MOA) in the first girls’ hockey game to be played under the league’s banner. Previously, girls’ hockey teams had been part of the Southeastern Mass Girls Hockey League (SEMGHL), but now the Hockomock had expanded enough to have its own competition, although, as Franklin coach Margie Burke explained, her young Panthers squad was more concerned with the start of a new season rather than a new league. Amanda Lewandowski scored the historic first league goal and Franklin led 2-0 until late in the game, but the Warriors scored twice in the final 7:27 of the game to come from behind and ensure that both teams went home with their first Hockomock League point. Franklin took the lead a little more than two minutes into the game. On the power play, junior Regan Paterson swung the puck around to Jackie Connelly, who fired a shot towards the far post. Lewandowski was on hand at the back post to redirect the shot into the back of the net for a 1-0 lead. 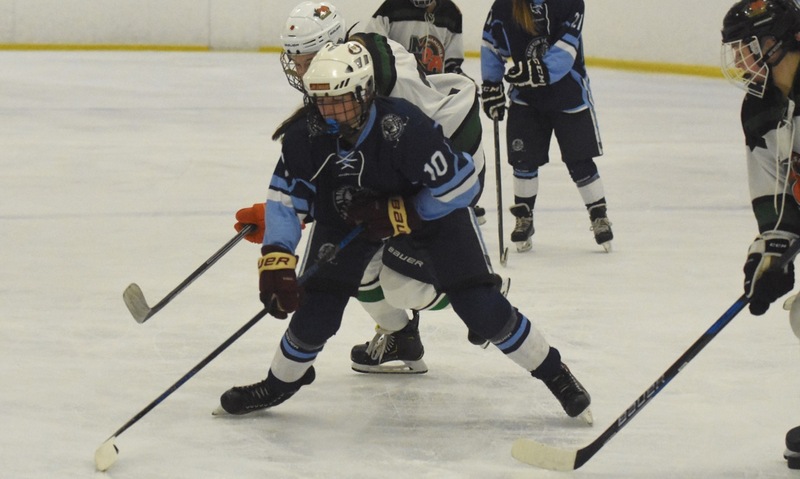 MOA had its chances in the period with Mackenzie Fraser creating a scoring chance after shrugging off two defenders on the far boards, but Franklin freshman goalie Natalie Stott made the stop. Two minutes later, Stott (30 saves) came up big again, this time making a series of three close-range saves to deny a tying goal. Franklin doubled the lead with 3:47 left in the first. Connelly again got the assist when she played the puck up the boards out of her defensive zone. The puck skipped past an MOA defenseman and Paterson was first to it, racing three quarter of the rink before planting her wrister top shelf. 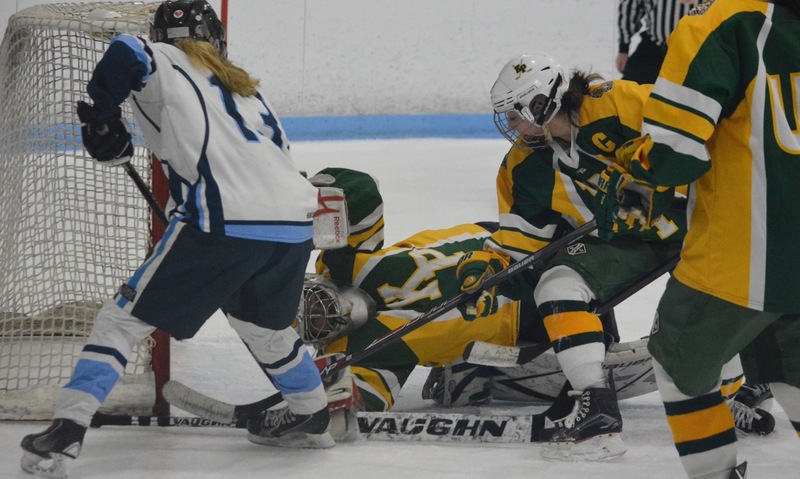 Paterson had another opportunity early in the second but after dragging the puck past the defense her shot was gloved by MOA goalie Cate Gallagher. The Warriors had their share of chances to cut into the lead, holding a 24-12 advantage in shots after the second (32-19 for the game), but Stott continued to make big saves. Lindsey Corning had her shot from the slot kicked aside by a quick right pad, then Stott showed quick reflexes to stop a deflected drive from the point by Melissa Shanteler. In the final seconds of the period, Catherine Luciano split the Franklin defense with an outlet pass to Kristina O’Connell for a breakaway, but Stott went full split to block the shot at the far post. Dalton admitted that the Warriors were getting frustrated heading into the third. The hosts started the third strongly and nearly put the game away. 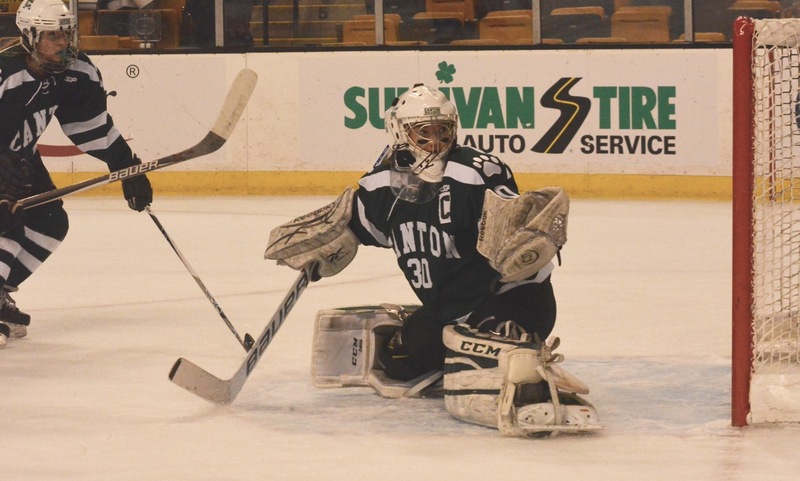 Gallagher made a series of saves in the first few minutes, including several off shots from the point by Gianna Cameron, to keep the Warriors alive. MOA finally found a way through with 7:22 to play. O’Connell got another chance on a breakaway and she picked out the top corner high on the glove side to cut the lead to 2-1. With two minutes to play, MOA pressure paid off and tied the game. After a scramble in the crease, in which Stott made two close-range saves, the puck squirted out to the far post where Denae Reager was on hand to punch it in. Franklin had an opportunity on the power play for the final 1:22 and Burke used a timeout to ensure that her young team would be careful and earn a season-opening point. 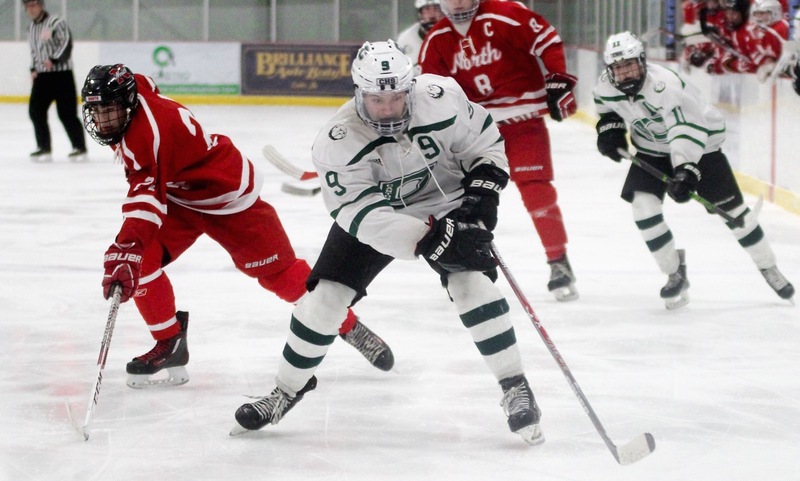 Franklin (0-0-1) will travel to the New England Sports Center in Marlboro to face Medway/Ashland on Monday, while Mansfield/Oliver Ames (1-0-1) will head to the Jim Roche Arena in West Roxbury to face Ursuline Academy.